Maximum size: about 64 mm (Hoover, 2006). Identification: This species has an elongate, high, white body with numerous lemon-yellow spots. The mantle margin is dark blue-black with blue-black “scallops” extending onto the notum. These scallops usually contain one or more gold spots though they are absent in younger animals. The pattern on the margin is quite variable and distinctive allowing individuals to be recognized. Dusky "staining" may be present on the notum in some animals and the size and spacing of the yellow spots is variable. The rhinophore club is dark blue-black with white flecks on the lamellae and longitudinal white lines along the anterior and posterior faces. The gills are white with dark blue-black edges. Very young animals have a more "faded" coloration and develop their yellow spots gradually as they grow. 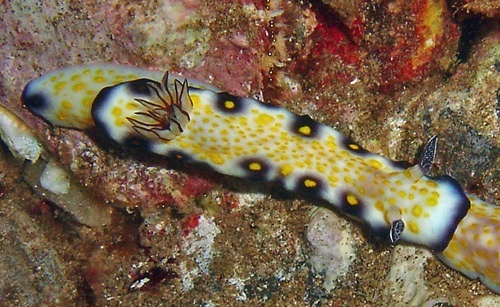 Natural history: Hypselodoris imperialis is a common, diurnal species found on protected to exposed rocky bottoms, sometimes under silty conditions. (Note 1) It is often found in pairs at depths of 1-33.5 m (3-110 ft) and is one of several chromodorids that vibrate their gills. Individuals of the genus Hypselodoris are often found "trailing" one another, a behavior where one animal follows another so closely that the head of the follower actually touches, continuously or intermittently, the tail of the other as they crawl. The reason for this behavior is not known but may be an adaptation to insure repeated mating between two individuals. It is known to feed on the blue-gray sponge, Dysidea fragilis (Bertsch & Johnson, 1981). (Note 2) The egg mass is a light, tomato-orange, usually with three whorls and a ribbon height of about 9 mm. Distribution: Big Island, Maui, Molokai, Oahu, Kauai, French Frigate Shoals, Pearl & Hermes Reef, Midway and Kure: widely distributed in the western & central Pacific. Photo: PF: Makena, Maui; July 31, 2007. Note 1: This species has had noticeable population swings with years passing between sightings. It was present in high numbers on Oahu in the late 1970s and early 1980s during which Scott Johnson reported seeing as many as 50 on some dives in the Ala Wai Yacht Harbor. Sometime in 1983, the species largely disappeared on Oahu. From 1987 to 1995 we didn't observe any H. imperialis on Maui. We recorded our first in Sept. of 1996 and have seen them regularly up to the present. From spring 2009 to spring 2014, they were one of the most commonly seen species on Maui. Note 2: We've seen mature animals feeding on the blue-gray sponge, Dysidea fragilis. However, we've also photographed a young animal apparently feeding on a brown sponge. Whether the latter is a color form of Dysidea fragilis or G. imperialis may also feed on related species (perhaps, only when young?) is unknown.